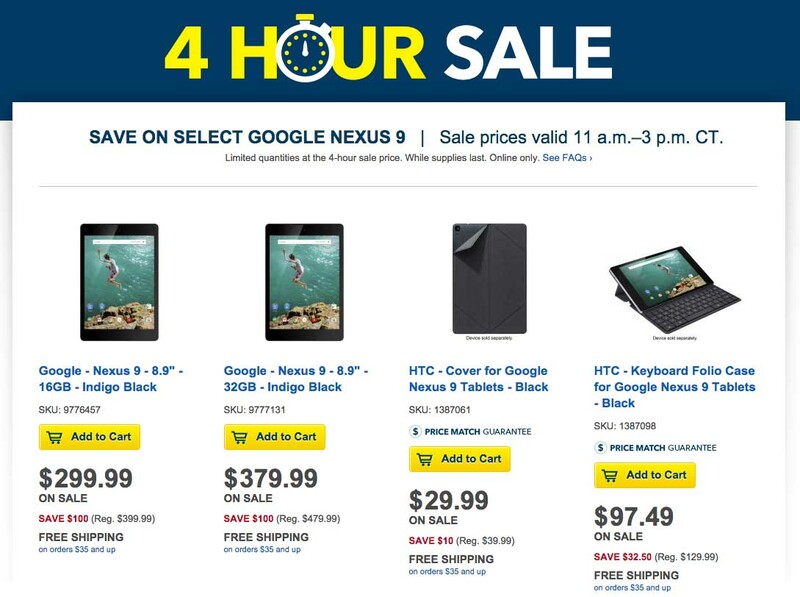 Best Buy is hosting a really solid 4-hour sale today that slashes $100 off Google’s new Nexus 9 tablet. Both the 16GB and 32GB black models are included, so if you are interested, you can get into a Nexus 9 for $299 or $379, respectively. Most of us always thought the Nexus 9 should have been priced at $299 and $379 out of the gate. In other words, this deal is completely worth it. Best Buy isn’t just stopping with the tablet itself, though. They are also offering up the Magic or Smart Cover for the Nexus 9 at $29.99 (normally $39) and the Keyboard Folio for $97.49 (normally $129). Finally, the Chromecast has been dropped to just $29, which is a $5 discount. The deals are live now and end at 3PM CT. Cheers Ryan, Brandon, and Chris!